Sweet, creamy, juicy and just a kiss of tart – Blueberry Cheesecake Scentsy Go pods capture every sweet-smelling nuance of their indulgent namesake. There are no oils or wax in these unique pods – special fragrance beads deliver a sensational scent experience for up to 120 hours. 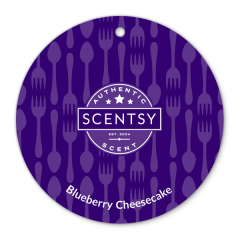 Every sniff will reward your senses with the rich bakery-inspired goodness of cheesecake, the unexpected brightness of blueberries, all wrapped in a buttery graham cracker crust. Each Blueberry Cheesecake Scentsy Go pod in this duo can be used independently for a light level of fragrance, together for a boosted, stronger fragrance, or mixed with other Scentsy Go pods to make your own layered creation. There are no oils or wax in these unique pods – special fragrance beads deliver a sensational scent experience for up to 120 hours.